1. Daughter Luz Urquieta was born February 15, 1903 in Lajitas and was baptized there May 15, 1903 by Father Brocardus from St. Joseph’s Catholic Church in Fort Davis. Her godparents were Francisco Levario and Francisca Carrasco. She married Inez Perez in Terlingua April 22, 1923. He was born circa 1901 in Sierra Mojada, Coahuila, Mexico, the son of Pedro Perez and Basilia Hernandez. Inez worked as a mechanic for the Chisos Mining Company from 1925 at least until 1934. By 1943 Luz and Inez had moved to El Paso, where he worked as an operator for the Phelps Dodge Refining Co. Luz died of cancer April 17, 1951. On April 3, 1955 Inez died of injuries suffered in an automobile accident in El Paso. Both are buried in Evergreen Cemetery, El Paso. A. Daughter Balbina Perez was born in Terlingua March 29, 1925 and was living with her parents in Terlingua in 1930. B. Daughter Maria Grace Perez was born in Terlingua April 9, 1932. She was delivered by Chisos Mining Co. physician Dr. E.A. Montenyohl. C. Daughter Juana Perez was born in Terlingua June 25, 1933. She died of diphtheria in Terlingua May 22, 1934 and was buried in the Terlingua Cemetery the following day. 2. Son Amado Urquieta was born in the Terlingua area September 5, 1906. He was baptized in Terlingua September 26, 1906 by Father Brocardus. His godparents were Sixto and Francisca Luna. In 1910 he was living with his parents in the Terlingua area. He died January 12, 1918 and is buried in the Terlingua Cemetery. 3. Son Demencio Urquieta was born in the Terlingua area October 31, 1907. He was baptized in Lajitas May 1, 1908 by Father Brocardus. His godparents were Eligio Sanchez and Catarina Sosa. He was living in the Terlingua area with his parents in 1910 and 1920. In 1930 he was working as a laborer in the quicksilver mines. He married Juana Pardo January 31, 1934 in Brewster County. 4. Son Manuel Urquieta was born in the Terlingua area April 19, 1909. He was baptized in Chisos by Father Brocardus May 11, 1909. His godparents were Isabel Vega and Francisca Alvarado. Manuel apparently died as a small child. A. 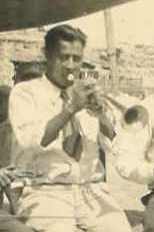 Son Juan Flores was born June 24, 1931 in Terlingua. He was delivered by midwife Rosaria Mata. He died of gastro enteritis in Terlingua on June 10, 1932 and was buried in the Terlingua Cemetery the following day. B. Daughter Agustina Flores was born in Terlingua August 28, 1932. She was delivered by midwife Rosaria Mata. She died in Terlingua October 19, 1933 and was buried there the following day. C. Daughter Beatrice Flores was born in Terlingua July 28, 1934. D. Son Epifanio Flores was born in Terlingua, probably in 1935. E. Son Juan Flores was born in Shafter April 21, 1936 and died there of bronchitis January 31, 1937. He is buried in Shafter. F. Daughter Ambrosia Flores was born in 1938, probably in Shafter. She died of pneumonia in Shafter February 9, 1939 and is buried in Shafter. G. Son Dickie Flores was born in Tempe, Arizona August 7, 1948. The family resided in Superior, Arizona at the time. He died in Tempe Hospital November 17, 1948 of acute enterocolitis and is buried in Superior. A. Son Manuel Urquieta was born August 28, 1932 in Terlingua. In April 1940 he was living in Shafter with his parents. B. Daughter Teresa Urquieta was born in Texas circa 1935. In April 1940 she was living with her parents in Shafter. C. Son Jose Urquieta was born Marcy 15, 1937 in Study Butte. In April 1940 he was living with his parents in Shafter. D. Son Magdaleno Urquieta was born May 29, 1939 in Brewster County. In April 1940 he was living in Shafter with his parents. E. Son Inez Urquieta was born January 21, 1943 in Brewster County. After the death of his first wife, Juan Urquieta married Mauricia Martinez in Terlingua on April 4, 1921. She was the daughter of Chon Martinez and Mauricia Vasquez. Juan and Mauricia continued to live in Terlingua until 1944, when they moved to Alpine. Their home in Alpine was on East Avenue F. Juan died in Alpine of bronchial pneumonia October 18, 1955. Mauricia died January 25, 1994 at the age of 104. Both are buried in Holy Angels Cemetery. Juan and Mauricia had nine children. A. Daughter Elfidia Molinar was born in Brewster County February 13, 1944. B. Daughter Elia Molinar was born in Brewster County January 13, 1946. C. Son Daniel Molinar, Jr. was born in Brewster County December 11, 1947. 2. Son Vicente Urquieta was born July 24, 1924 in Terlingua. He married Maria Elena “Mary Helen” Ramirez July 1, 1944 in Alpine. Her parents were Eustaquio Ramirez and Maria Lujan. By 1949 they were living in Odessa, where Vicente worked as a laborer on a construction crew. He died December 19, 1966 of hemorrhaging after accidently running his arm through a glass door. He is buried in the Odessa Cemetery. Elena was still living in Odessa in March 2012. (2) Son Steven Urquieta was born in Odessa October 25, 1983. In October 2012 he was working for Sewell Ford. (3) Son Alejandro Urquieta was born March 8, 1986 in Odessa. In October 2012 he was working for Verizon. (4) Daughter Jacqualine Urquieta, twin of Jessica, was born May 11, 1988 in Odessa. In October 2012 she was working for the City of Odessa. (5) Daughter Jessica Urquieta, twin of Jacqualine, was born May 11, 1988 in Odessa. In October 2012 she was a nurse. B. Daughter Erlinda Urquieta was born August 10, 1953 in Kermit. She died in Medical Center Hospital, Odessa of septicemia on May 5, 1954 and is buried in the Odessa Cemetery. (1) Son Jesse Urquieta Garcia was born November 21, 1996 in Odessa. (1) Son Ramon Balboa was living in San Antonio in March 2012.
a. Daughter Stevie Nikkole Train was living in San Antonio in March 2012. C. Son Richard Macias was living in Tucson, Arizona in March 2012. A. Son Oswaldo Urquieta Villalba was born in Brewster County June 16, 1953. B. Son Jaime Urquieta Villalba was born in Brewster County July 20, 1954. C. Daughter Nelda Kathaline Villalba was born in Seminole July 23, 1956. She died of pneumonia in Alpine December 1, 1956 and is buried in Holy Angels Cemetery. D. Daughter Nelda Kathaline Villalba was born in Brewster County August 23. 1957. 5. Daughter Catalina Urquieta was born May 1, 1930 in Terlingua. On 29 June, 1958 she married Angel Bermudez, son of Merced Bermudez and Telesfora Morales. In January 1994 she was living in Alpine. 7. Son Flavio Urquieta was born October 5, 1937 in Terlingua. He died there the following day and is buried in the Terlingua Cemetery. A. Son Roberto Alfredo Cordova was born February 8, 1972 in Brewster County. B. Daughter Toni Lynn Cordova was born January 8, 1973 in Brewster County. C. Daughter Sara Gwen Cordova was born June 13, 1974 in Brewster County. D. Son John Edward Cordova was born May 9. 1976 in Brewster County. E. Daughter Rebecca Joy Cordova was born June 3, 1977 in Brewster County. 9. Son Hector Urquieta was born February 24, 1946 in Alpine. By January 1994 he had changed his name to Balderrama and was living in Alpine. 1900, 1910, 1920 and 1930 Brewster County census records. Brewster County birth and marriage records. Death records for Brewster, Ector, El Paso and Presidio Counties in Texas and Maricopa County in Arizona. Mauricia Urquieta obituary, Alpine Avalanche, February 1994, obituary files, Archives of the Big Bend, Sul Ross State University, Alpine, Texas. Wayne Cartledge Collection, Archives of the Big Bend, Sul Ross State University, Alpine, Texas.